DRESDEN, Germany, Aug. 17, 2010 — A new laser technology using accelerated ion beams to irradiate cancer cells while sparing more of the surrounding healthy tissue has been developed. Researchers at the OncoRay center and the Forschungszentrum Dresden-Rossendorf (FZD) research center are using the high-power laser Draco to generate protons, accelerating them on a scale of <10 µm. The advantage of accelerated ion beams is that they have their highest impact in the tumor and therefore have a better ability to spare healthy tissue. 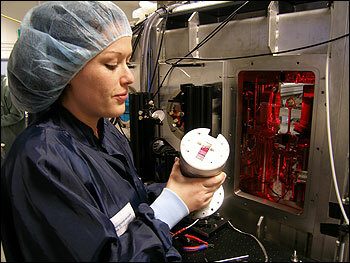 Currently, accelerated hydrogen and carbon ions are mainly used to treat inoperable tumors in organs such as the brain and bone marrow, which are sensitive to radiation therapy, but traditional proton and ion accelerators are large and expensive, which is why making use of accelerated proton and ion beams can be applied in only a few clinics, including the Heidelberg Ion-Beam Therapy Center (HIT). According to the team of researchers, proof of the advantages of the proton and ion therapy will drive the future of compact radiation facilities for cancer treatment. Today, more than 60 percent of cancer patients undergo radiation therapy. In traditional therapy, a considerable part of the energy of photon beams generated in modern clinical linear accelerators is emitted on their way through healthy tissue. Ion beams, on the other hand, can be stopped right in the tumor with utmost precision, where their damaging impact is released on all tumor cells. This new method was successfully tested in the heavy ion therapy project at GSI (Helmholtz Center for Heavy Ion Research) in Darmstadt. About 400 patients were treated and about 70 percent were cured. FZD scientists collaborated on this project and are also significantly involved in the HIT center. There is still a lot of basic research to be done until the first clinical applications of high-power lasers. Scientists from Dresden are strongly involved in this and are likely to make essential contributions to the worldwide run for new applications, drawing on the close collaborations of medical scientists, physicists, biologists and mathematicians in Dresden. OncoRay scientists at University Hospital, FZD and TU Dresden are focused on translational research, which means that results from basic research are to be transferred to clinical applications as soon as possible. The first compact irradiation facility applying laser technology could be put up in hospitals in 10 to 15 years. The next step toward clinical application is to carry out detailed studies comparing the impact of laser accelerated ion beams with radiation traditionally used in cancer therapy.